It is important to have a secure environment, enforcing the least privilege principle in your servers and databases, but this can be difficult to achieve on large environments, where a lot of people have elevated privileges or several people have permissions to perform tasks over your data or schema. As an additional measure, an audit log should be implemented in those scenarios and review these often. 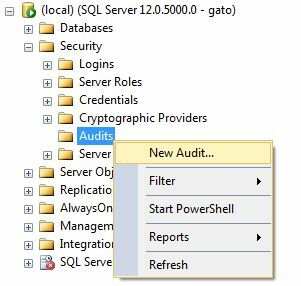 SQL Server provides the functionality to implement audit logs at Server and Database level. 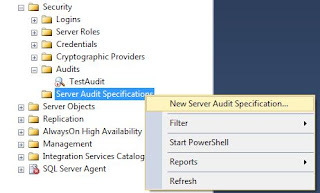 Starting SQL Server 2008, all SQL Server editions support Server level audits. 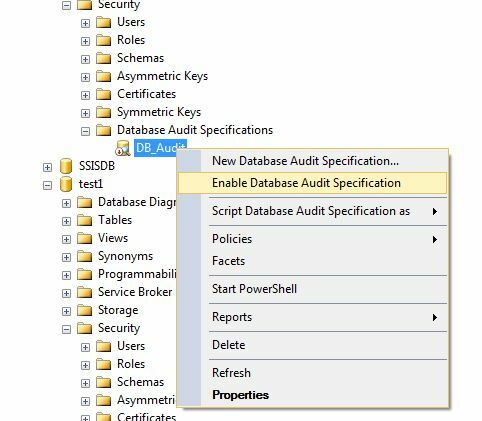 Database audits are supported beginning with SQL Server 2016 (13.x) SP1. Prior to that, database level auditing was limited to Enterprise, Developer, and Evaluation editions. 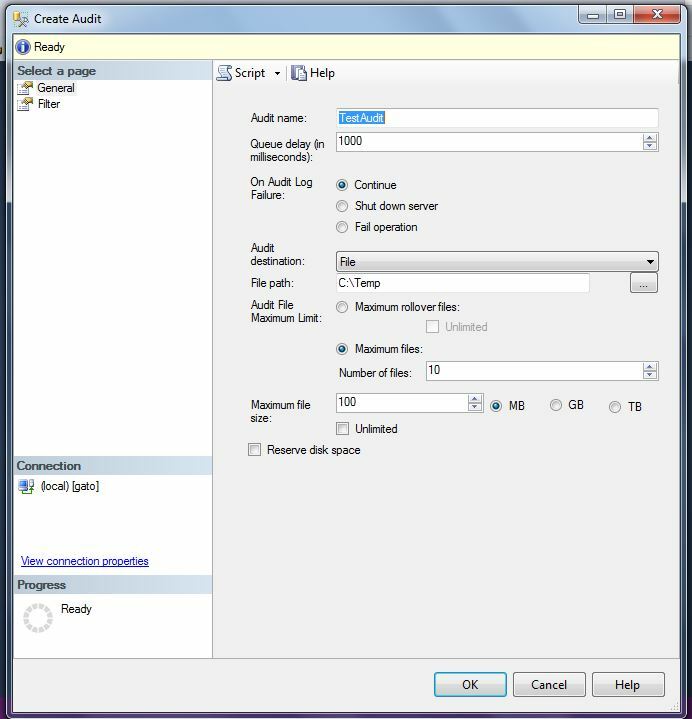 Specify a name for the audit and select an audit destination (I personally prefer a file location). Select the desired parameters and click OK. The Audit is now created, for it to work just enable audit. 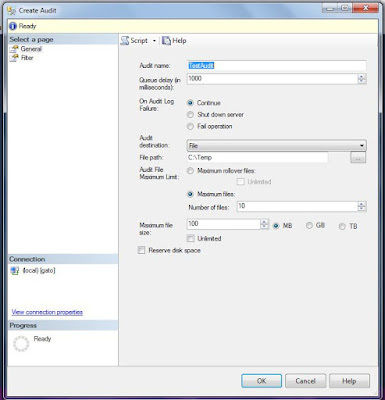 NOTE: before making any changes to the audit configuration, you will need to disable it first. We have created our audit location, now we will proceed to create the actions we want to audit at server level. In the next window, Specify a name for the audit (you can have more than one) and select the audit created in the previous step. Choose the action or actions to be audited. To check what is included on each action, please read here from Microsoft documentation. 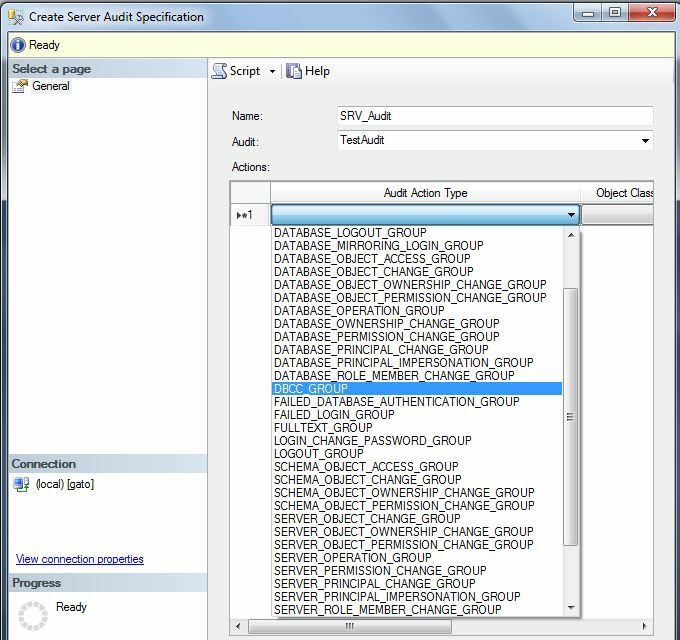 Once you are done click OK to create the audit specification. 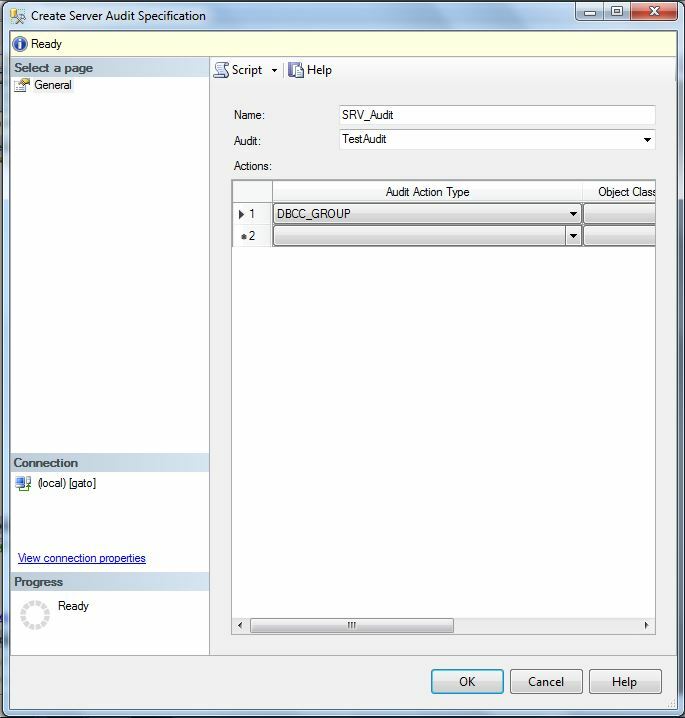 The Audit specification is also created disabled, to make it work, enable it as shown in the image. NOTE: before making any changes to the audit specification, you will need to disable it first. The process is relatively the same to create a database level audit specification, the main difference is that the option is located under the Security folder on each database. 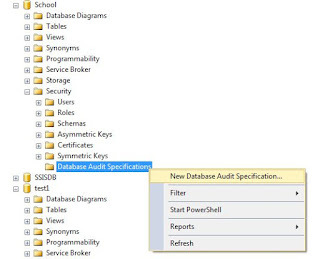 Select the name of the Database Audit and the audit destination (the same created in first step for this example). 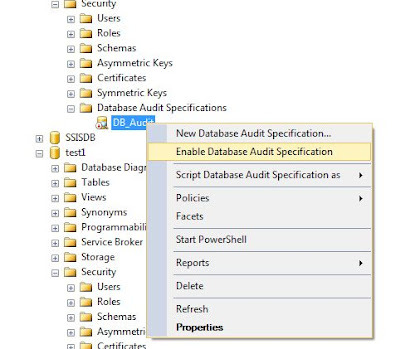 Another of the key differences for Database Audits is that we have to select the object or schema we want to check. 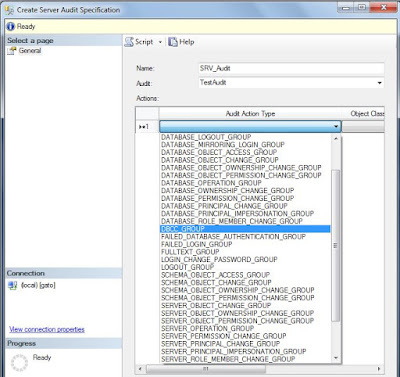 Select the actions to audit (you can see description for each one here), and then click Ok.
For this example I will audit the SELECT command over the a table named Course in a sample School database. After the creation of the audit specification, you must enable it to run. 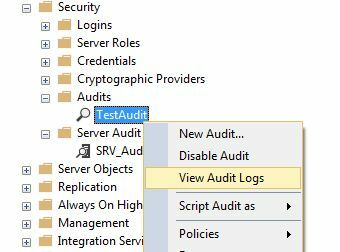 Having the audits configured and running is just half of the work, it will worth nothing if you don't proactively review the logs often. For this example I have executed some sentences to trigger the server and database audits configured above so we can see some data. For using this option, you use the DMF sys.fn_get_audit_file, specifying the file location, and for file name use *.sqlaudit to include all the files. I have marked in yellow the actions that have been captured in the database specification. 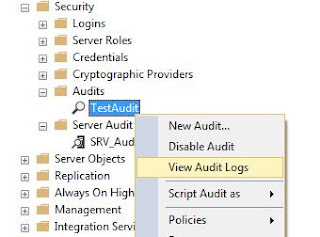 With this info you are good to go configuring your own audits for your Mission critical servers and review them often, also you could implement an alert or automatic reporting logic to be notified on suspicious activity.